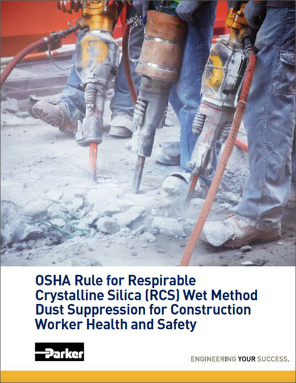 Respirable crystalline silica (RCS) is a hazardous substance found in bricks, clay, concrete, mortar, rock, stone and many other materials common to construction sites. The dynamic action of construction equipment can release RCS into the air and expose workers to serious health threats. The new OSHA standard for the construction industry went into affect on September 23, 2017. Non-compliance to the rule could result in sustained risks to worker health and safety, costly OSHA penalties and damaged brand image. "OSHA estimates that the Final Rule will save over 600 lives and prevent more than 900 new cases of silicosis each year, once its effects are fully realized. The Rule is projected to provide net annual benefits of as much as $7.7 billion to society in terms of reduced costs associated with preventing and treating silica-related illnesses."